Sept. 17, 2012 - PRLog -- NEW YORK, NY — On Friday September 21, from 12 pm until 2 pm, Sol Afrik Fashion Week New York (SAFWNY) will stage an invite-only fashion showcase at the Rush Galleries located on 526 West 26th Street, Suite 311, Manhattan, NY. Serving as a global platform for exceptional couture and ready-to-wear designs, SAFWNY’s showcase will attract press coverage, fashion industry professionals, enthusiasts, and savvy fashion-conscious consumers. Sol Afrik will not feature the week-long series of exhibitions that were scheduled to be part of their platform this year. 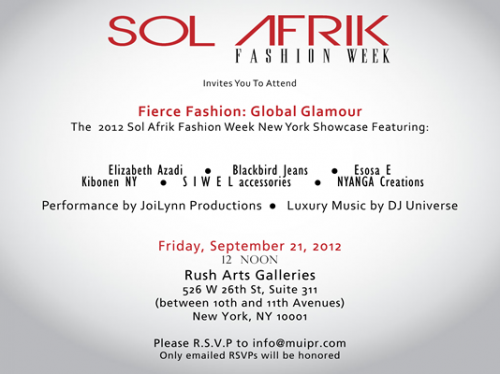 In order to dedicate resources and build momentum for its official launch during the 2013 Fashion Week in New York, Sol Afrik will stage just one showcase this season: The lavish fashion and accessories show this Friday afternoon. Friday’s SAFWNY fashion showcase will highlight glamorous accessories and stunning styles and trends from six designers across the globe: Elizabeth Azadi, Blackbird Jeans, Esosa E, Kibonen NY, Siwel Accessories, and Nyanga Creations. The event will also feature exclusive video coverage by Black Enterprise, complimentary cocktails and giveaways from sponsors such as Tea by Tiffany, Nu Ade, Cakes by Violet, Vita Coco, Bed-Vyne Wine and Manche Tees, cocktails, a special performance by JoiLynn Productions and luxury music by Afro-Electronic Music creator DJ Universe. Free admission will be honored with emailed RSVPs only: info@muipr.com. Visit SAFWNY today to learn more. Socialize with SAFWNY via its blog, or on Facebook, twitter, and pinterest and follow its countdown to SAFWNY 2013!